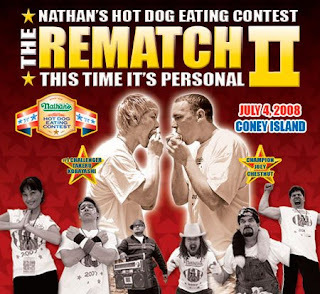 Joey Chestnut defeated Japan's Takeru Kobayashi for the second year in a row in the Annual Nathan's Hot Dog Competition! The two hot dog champs tied (each finished 58 dogs in 10 minutes) and had to go into overtime. In overtime, Chestnut ate 5 hot dogs down before Kobayashi. They set a new record for most hot dogs eaten in ten minutes though- Congrats to both! !